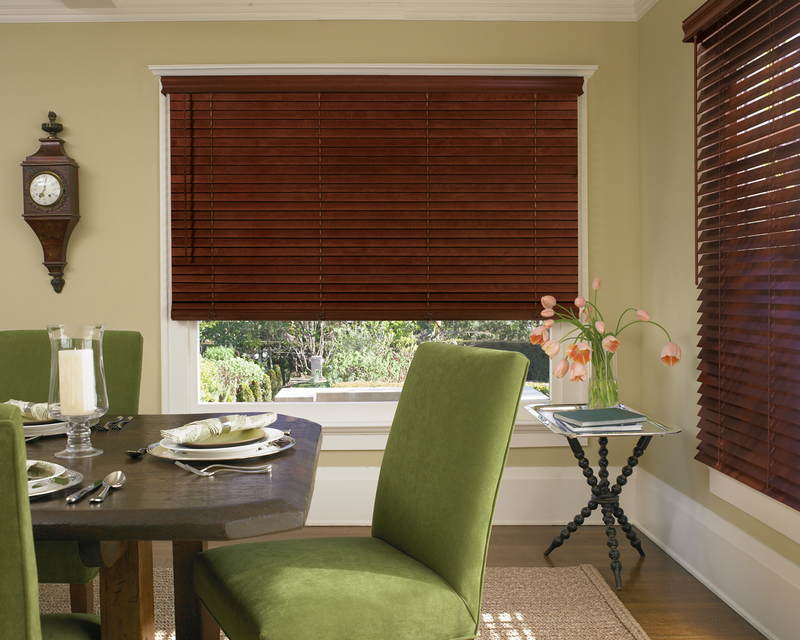 The rich, natural of hand-crafted wood blinds will add warmth and beauty to any room. Our collection of unique sizes and decorative styles will fit ant scale window and provide maximum view-through to let the outdoors in. A wide selection of special features and options are available allowing you to provide your customers with a truly customized look. 1 3/8”, 2” and 2 3/8” slat sizes to fit any window size. Over 40 colors and styles, from whites and neutrals to rich wood tones. Decorative styles including enhanced grain, distressed, rustic and bamboo will blend with any décor. A wide section of optional solid and decorative tapes add a fashion accent. Optional LightsOut feature blocks additional light, enhances privacy. Rounded corners, available at no extra charge, soften the blind’s appearance. Modern trapezoid bottomrail shape improves appearance and operation. Cordless Lift system allows the blind to be lifted and lowered with ease, and may be combined with RemoteTilt. RemoteTilt motorization systems offer easy operation with the touch of a button. Decorative wood tassels with a unique break-thru stop ball help protect children and pets from dangling cords while enhancing the blind’s overall beauty. Limited Lifetime Warranty ensures your customer’s satisfaction. 1 3/8” – Designed for smaller scale windows – provide more view-through and less stack than a traditional 1” blind. 2” – standard slat size that’s perfect for any size window. 2 3/8” – Larger slat size that provides optimal view-through, economical alternative to shutters. Smooth Finish: Offered in writes, neutrals, and a variety of wood stains. Enhanced Grain: Refined grain styles a rich tone-on-tone appearance. Rustic: Features knots and grain variations, offering unique appeal for casual settings. Distressed: The appearance of aged and weathered wood with subtle tone-on-tone grain. A decorative 3” valance with adjustable mounting clips comes standard on every blind. Its distinctive style will blend in with any decorating style from traditional to contemporary. Custom return lengths from 1/2” to 6” are available upon request. A sleek, contemporary 3” crescent shaped valance profile may be selected as a free option. Our slim design low profile headrail is strong enough to cover large windows with a single blind, yet slim enough to reduce stack and allow more view. Box mounting brackets are color-coordinated and easy to install. Spacer blocks, extension brackets, and hold down brackets are also available for installation flexibility. Our innovative, proprietary magnetic valance clips make valance installation quick, easy and secure while also allowing for customs height and projection adjustments. Solid and Decorative Tapes – Over 60 choices of solid and decorative tapes in a variety of colors and styles add a fashion accent, cover route holes, and increase privacy. Tapes can also be added to the decorative valance to provide a completely coordinated look. Rounded Corner – No charge option that softens the blind’s overall appearance. LightsOut Feature – Routeless design reduces light leaks and enhances privacy. Cordless Lift System – Lifts and lowers with ease. Eliminates lift cords making them safer for children and pets. RemoteTilt Motorization Systems – Battery-operated multi-channel Radio Frequency (RF) systems tilt blinds open and closed with the touch of a button and the multi-channel version allows for independent blind operation. Combine with wall switches or timer for total convenience. Batteries for both the blind and remote are included.